I was going through my file cabinets this week and ended up going through my high school memories too. I think the reason we keep old junk isn’t because we need the junk but because we like that it triggers memories that we haven’t accessed for years. At least that’s what happened to me when I found a folder full of the stuff I had on a bulletin board in my room back in high school. Among the items was a She-Ra mobile, a signed photo of Lisa Loeb, and the nicest rejection letter I ever got. The rejection letter was sent by Louisville magazine in 1997 when I was a 16-year-old junior in high school. 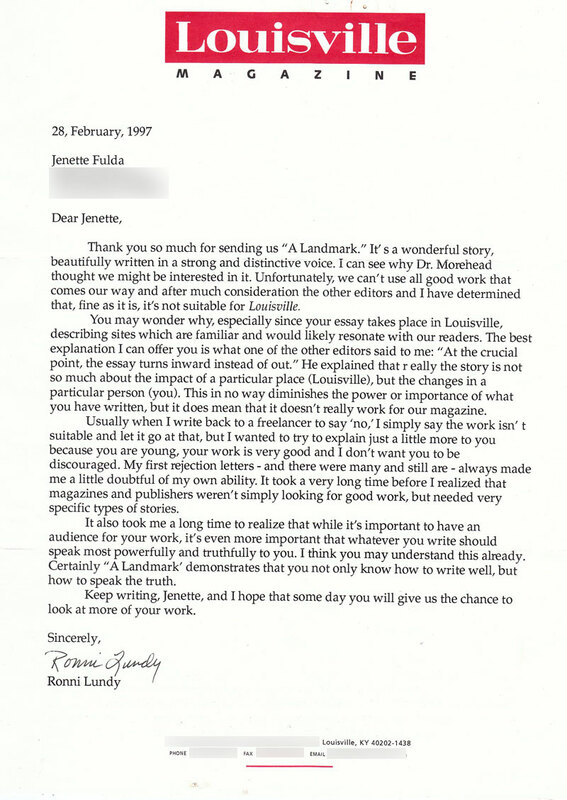 I’d written a personal essay for English class which had Louisville as a focus, and my teacher suggested I send it to the magazine since she’d heard they were interested in submissions from people my age. You can click on the image of the letter below to read it, or you can read the transcription below that. Thank you so much for sending us “A Landmark.” It’s a wonderful story, beautifully written in a strong and distinctive voice. I can see why Dr. Morehead thought we might be interested in it. Unfortunately, we can’t use all good work that comes our way and after much consideration the other editors and I have determined that, fine as it is, it’s not suitable for Louisville. You may wonder why, especially since your essay takes place in Louisville, describing sites which are familiar and would likely resonate with our readers. The best explanation I can offer you is what one of the other editors said to me: “At the crucial point, the essay turns inward instead of out.” He explained that really the story is not so much about the impact of a particular place (Louisville), but the changes in a particular person (you). This in no way diminishes the power or importance of what you have written, but it does mean that it doesn’t really work for our magazine. Usually when I write back to a freelancer to say ‘no,’ I simply say the work isn’t suitable and let it go at that, but I wanted to try to explain just a little more to you because you are young, your work is very good and I don’t want you to be discouraged. My first rejection letters – and there were many and still are – always made me a little doubtful of my own ability. It took a very long time before I realized that magazines and publishers weren’t simply looking for good work, but needed very specific types of stories. It also took me a long time to realize that while it’s important to have an audience for your work, it’s even more important that whatever you write should speak most powerfully and truthfully to you. I think you may understand this already. Certainly “A Landmark” demonstrates that you not only know how to write well, but how to speak the truth. Keep writing, Jenette, and I hope that some day you will give us the chance to look at more of your work. Doesn’t that letter make you feel good? Or rather, wouldn’t you feel good if it were written about you instead of about me? Whenever I read it I get happy about being rejected all over again. I applaud you Ronni Lundy, you have ensorcelled me with your writing skills. And, ok, she spelled my name wrong, but she wasn’t the first and she won’t be the last either. If you tell me I write beautifully in a strong and distinctive voice you can call me Leeloo if you want to. The great thing about this letter is that it basically says, “You got talent, kid!” but also explains why having talent doesn’t always mean you get published. I appreciate that she took the time to write me a letter explaining that instead of crushing my teenage heart with a terse rejection. Since I knew you’d be interested, I managed to dig up a WordPerfect file of the essay which I’d salvaged from a 3.5″ floppy disk several years ago. Does anyone else remember WordPerfect and that bright blue editing screen? The essay is redacted in one or two spots just to preserve some privacy. About six years, seventeen inches, and six shoe sizes ago, the day after I graduated from the fourth grade, my family packed up yet another green and yellow Mayflower moving van and headed south for Louisville, Kentucky. It was the fourth time in ten years that we abandoned the place we called home for another state where a job existed for my father. Dad never could seem to find a job where he and his employers were happy at the same time. So when the time came every two or three years, we’d just pack up and leave for another state, another city, another life. I don’t really remember much from the first day we came here, only images of buildings and trolleys and a little old lady who sat in the lobby of the hotel we stayed in our first night. My little brother, who was only six-years-old at the time, asked the little old lady if she would be his first friend in Louisville. That was a really mushy moment and she came close to tears. I can also remember the second day that I lived in Louisville. It was overcast (or maybe I just thought it was overcast) and my mother, my older and younger brothers, and I all went downtown to visit Dad at his new place of employment, the ———-Institute at The University of Louisville. (The department no longer exists; it was eliminated two years later.) It was an old building and didn’t look like an institute of anything to my ten-year-old eyes. We were going to meet him there for lunch and then go sign the papers that would officially buy us a home and put us several more thousand dollars in debt. But my father had some work to do or some papers to push or something that probably wasn’t worth the time now anyway. So Mom took us on her personal version of the walking tour of Louisville. I had absolutely no idea where we were. Heck, half the time I didn’t know where I was in my old town. How could I find my way around this strange new city that was ten times larger? I still don’t know my way around Louisville that well. But thankfully, my mother had a map and a pretty good sense of direction, so I didn’t feel totally lost. Eventually, after many bends in the sidewalk pavement, whose cracks I carefully avoided, we reached a circular courtyard which had a driveway and a sidewalk surrounding it. The place was located somewhere on campus. In the center was a magnificent red statue that seemed to blaze a fiery path out of the forsaken ground. It resembled tendrils of lava shooting up from the earth’s core in an enchanting dance rivaling the magnificence of a solar flare or an erupting volcano or another of nature’s wonders. That’s how I describe it today, but at the time I would have said it was merely a twisted assortment of red metal looming above me that didn’t look like much of anything. Someone told us that the University had just received it as a gift or something. Being slightly interested, we walked towards the structure and stopped when we reached the sidewalk surrounding it. “It looks like a dog dancing on its hind legs,” somebody said. “No, it looks like a bird with its head down,” said someone else. As I gazed at it, I realized that it looked like both of those things. My mother suggested that we look at it from another angle. So we walked about 60 degrees around the circle to look at the strange sculpture from a different perspective. “It looks like a big campfire,” someone said. And it did. We turned another 60 degrees around the circle to take another look, and continued until we’d seen this piece of art from all sides of the circle. And I did indeed see many things in its changing yet constant form. What I didn’t see were the buildings surrounding this sculpture. The concert hall, the library, the J.B.Speed Art Museum, and the high school in close proximity were all blocked out from my view of the world. Which makes it all the more ironic that these places took on great more significance in my life afterwards. The concert hall that was within 500 yards of the fiery masterpiece is the place were I played flute in the high school band for our fall concerts during ninth and tenth grade. It’s the building where I could never find the staircase to the balcony. The library, the place where the computer systems were confusing and the copy machines flashed a dazzling neon green light, was the destination of a field trip my ninth grade biology class took one day in January to look up buffalo for a school project. The J.B.Speed Art Museum was the place we went on another field trip in middle school to look at the tapestries, the fruit bowls, and the nudes. It was the place where the tour guides explained the importance of balance and color and told us we were their best behaved group. And my high school, only a block and a half away, is the place where I’ve spent years of my high school education learning about trigonometry and syntax and diction and the rate of a small furry creature’s fall from the top of the Empire State Building. Inside its brick walls I’ve made numerous friends, a few enemies, and a lot of memories. So, as I look at this sculpture today, its fire a little faded from the force of the elements, I don’t see a pointless mesh of metal or fiery tendrils sprouting and burgeoning from the earth or even a dog dancing on his hind legs. I see a little girl who’d never even picked up a flute in her life, a girl who wouldn’t have been able to understand most of the books in the nearby library, a girl who couldn’t tell a Van Gough from a Monet, a girl who didn’t even know what trigonometry was, much less be able to do it, a girl who at one time was me, but no longer exists. She faded away a long time ago and won’t be seen again, except in school pictures or birthday photos. In her place is a teenager who sees the world differently than that little girl did. Someone who has different thoughts, has different interests, and has different friends. And someday that teenager will be gone too, replaced by someone who I hope is a little bit wiser, a little bit stronger, and a little bit better than the teenager she’ll leave behind. But the statue that the little girl saw then and the teenager sees today, will probably still be there, standing erect and firm against the wind and rain and snow and all the other hardships that nature can produce. Its presence a constant in an ever changing world filled with ever changing people. Like a landmark on a road of time, it will always remind me of what I am, what I’ve been, and what I someday might be. Ok, that’s the end and now it’s me again talking to you from 2014. It’s funny how this essay acts much like that statue did so many years ago. It’s interesting to look back on something I wrote literally over half my life ago and think about how much I’ve changed since then. No doubt I’ll look back on this blog entry in another 16 years and think about all the stuff that’s happened to me since then with the same sense of wonder. If there are any rejection letters coming up, I hope they’re as nice as this one. That is the best rejection letter ever! I hope I get one like that one day. Actually I lie – I hope I only ever get acceptance letters. But if I do have to get rejected (I’m currently polishing my first novel) I hope someone takes the time to encourage me like that. I really enjoyed your essay, too. I had a teeny tiny snigger right at the end about the sculpture being “erect and firm”. At least you didn’t say it was engorged or throbbing. If I’d gotten a rejection letter like that at 16, it would have felt like an acceptance letter instead. What a nice thing for Ronni to do! And your essay was fantastic, by the way — I really enjoyed it. Thanks for the blast from the past with the WordPerfect screen — I totally remember that! @Natalie – Yeah, there were a couple parts in that essay where I wanted to get out my red pen and make some changes. Still, in comparison to some other stuff I wrote at the time this essay barely registered on the cringe-o-meter. You are amazing, Jennette! This is beautiful and I am dazzled by how accomplished you already were at 16, and how you continue to shine! Have a great holiday season! I love you! @Aunt Annette – Thanks, Aunt Annette! I hope you have a happy holiday too!